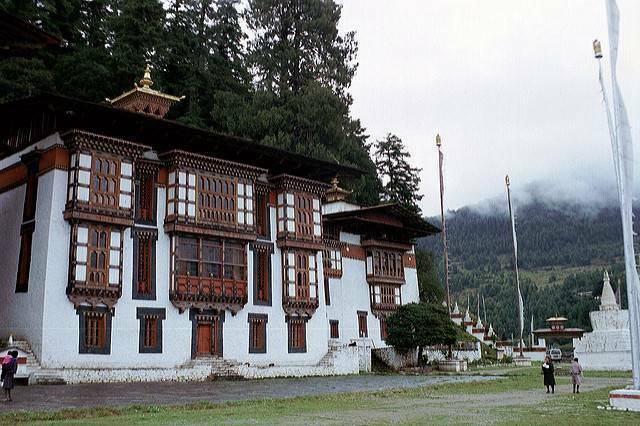 Also known as the Kurje Monastery, it is located in the Bumthang valley of Bumthang district, Bhutan. It is regarded as the only place where the remains of the first three kings of Bhutan are in resting. There is also a large tree behind one of the temples which is believed to be a left by Saint Padmasambhava. It is regrded as one of the sacred monasteries in Bhutan. Kurje Lhakhang was initially built by Trongsa Penlop while further a new building was constructed by late Queen Mother Ashi Kesang Wangchuk in the year 1990. There is a cave around the oldest of the three buildings where the body print of Guru Rinpoche is still preserved. The three temples are sorrunded by a 108 m Chorten wall. It is also said that the Cypress tree that hangs over the monastery of this place has grown out of the walking stick of Guru Rinpoche.